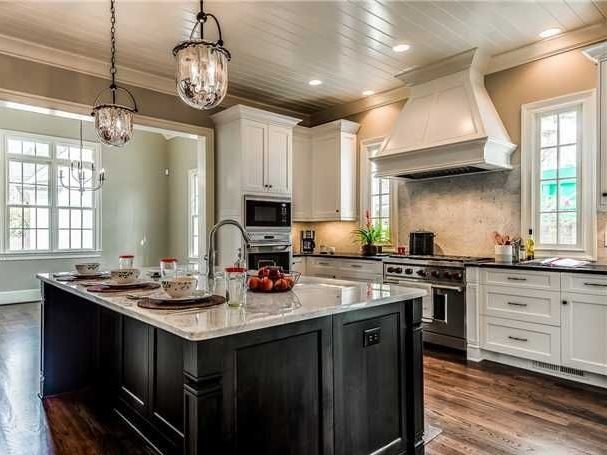 Lake Norman Granite + Cabinetry specializes in the fabrication and installation of slab countertops. From granite to quartzite we can assist you in finding the right material for your style and budget. Granite is the most popular natural stone type used for countertops. Granite offers a high level of resistance to abrasion and scratching. Granite counters are heat resistant and can withstand the heat of hot pots and pans without damage. Granite is also available in an amazing array of colorful and unique patterns and no two granite tops are exactly the same. Granite consists of quartz, silica, mica, obsidian, feldspar, and other natural minerals. Granite will need to be resealed when moisture soaks in, rather than beading up. Marbles, serpentines, and onyxes are traditionally prized for their unparalleled beauty. They are relatively softer than granite. Marbles can be scratched by kitchen utensils so it is best to use cutting boards and other protective measures. Use only non-abrasive products when cleaning marble. These stones are calcium carbonate based and can damaged by exposure to harsh cleaners and acidic solutions such as lemon juice, tomatoes,vinegar, etc. Acidic solutions can permanently etch the surface of the material. The application of a sealer will reduce, but not eliminate, the vulnerability to etching and staining. When purchasing DuPont Stone Tech or Dry Treat 15 year warrantied sealers when selecting marble for kitchen countertops. Quartz countertops are man-made engineered countertops formed by combining ground quartz (a natural hard mineral) with resins, polymers, and pigments. This forms a very hard granite-like surface. The appearance depends on how the quartz is ground: coarsely ground quartz produces a flecked appearance, while finely ground quartz produces a smooth look. Quartz is extremely durable, non-porous and stain-and-crack resistant. It does not require sealing or resealing. It is easy to clean. Quartzite is a metamorphic rock that has been formed from sandstone. With the new stylistic choice in countertops being light grey and white stones, a multitude of quartzite is the most optimal material to use. It offers the beauty of marble coupled with the hardness of granite. Soapstone is a natural stone that is quarried. It’s composed mostly of mineral talc, which makes it quite soft, but soapstone used for countertops typically has higher percentages of quartz in it, which makes it harder and more suitable as a kitchen surface. Soapstone requires maintenance. It is not as heat resistant as granite nor as impervious to dents and scratches. Regular oiling and buffing recommended.